124. Oshima, Shôtarô. W. B. Yeats and Japan. Tokyo: Hokuseido, 1965. Miner noted in 1958 (in A25) that after Yeats’s ‘period of studying nô with Pound’ he had other sources of information about Japan, but that questions remained about what they were. This work offers clear evidence of several, Suzuki (see D28), Yano (see 76), Noguchi (D15), Sato Junzô (see especially 21 and 48k), and Oshima himself, who from 1925 to 1938 corresponded with Yeats and sent him various items of japonaiserie, collections of ukiyoe annotated in English, shikishi (cardboard plaques) with reproductions of nô masks printed on them, and numerous Japanese books. Ultimately, however, the work disappoints as a critical study. Oshima undercuts this criticism in the preface, in contention that the book ‘has been planned chiefly [for] the purpose of publishing Yeats’s letters’ to him, and that ‘the essays . . . are intended as appendices’, yet in the same preface he calls attention to an ‘intimate interrelationship between Yeats and Japan’, and contends that ‘understanding of the poet cannot be approached without a knowledge of [this] connexion’. The trouble is that Oshima arguably is right about both points, but that they are not demonstrated here. The essays and editorial matter too often mix pride that Yeats had an interest in Japan with essentialist generalities about ‘Zen wisdom’ or ‘Eastern ways of thinking’, or supposed similarities in the ‘racial attitudes’ of the Celts and the Japanese (see also 119b and 249). Oshima is impeccable with details relating to Yeats’s acquaintance with particular Japanese works and people, but this does not in itself contribute instrumentally to the critical discussion. 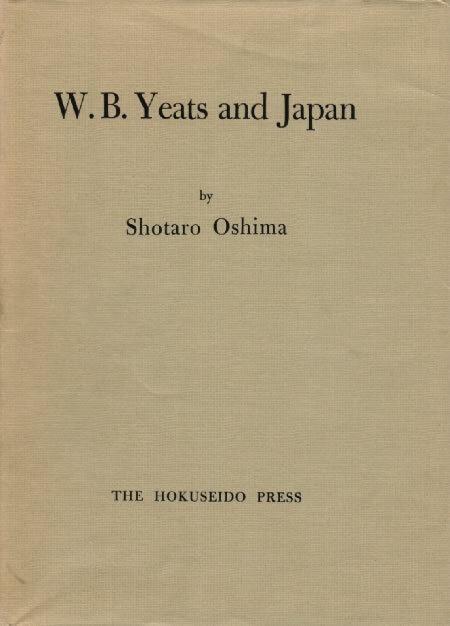 In addition to Yeats’s letters to Oshima (see 52) and material noted below, includes numerous rare photographs of Yeats and subjects related to his Japanese interests, along with other material less pertinent to this study. Several of the letters printed here appeared first in Oshima’s earlier publications, including Yeats kenkyû (Yeats studies, 1927), Yeats (1934), and Yeats: hito to sakuhin (Yeats, the man and his work, 1961). 2. Note to the letter to Yano of January 1928 (52e). Yano taught in 1928 at Taihoku Imperial University in Taiwan, and arranged for an invitation to Yeats to lecture for three months there and, apparently, to stay in Japan proper either before or after the appointment. Yeats mentions the offer in letters to Olivia Shakespear of 31 July and 9 August 1929 (48s-t). See also 52f. b. ‘Yeats and the “Noh” Plays’. Part I reprints ‘Yeats and the Japanese Theatre’ (119b); part II adds discussion of ‘the essential relationship between the Noh plays and the plays of Yeats’, suggesting that the form provided him with ideas about a small and aristocratic audience, the use of masks, plot structure from mugen nô, and methods of presenting ghosts on stage. c. ‘Yeats and the Zen Philosophy’. Revised version of Part I of ‘W. B. Yeats and Japan’ (113). d. ‘The Elements’. Suggests that in the ‘racial memory’ of the Irish and the Japanese may be found similarities in folklore about stones and water, and that Yeats uses these ‘elements’ as symbols in ways similar to classical Japanese and Chinese poets. e. ‘”Buddha’s Emptiness”’. By far the most insightful of the critical articles in the collection. A convincing reading of The Statues (43), which finds Yeats’s understanding of Zen, via Suzuki, behind the philosophical stance of the poem. F. A. C. Wilson in review of the work (see i below) finds that Oshima’s analysis ‘entirely resolves all problems’. See also 113.
f. ‘An Interview with W. B. Yeats’. More Oshima’s recollection of his 5 July 1938 meeting with Yeats than presentation of the interview itself. Notes the japonaiserie in Yeats’s study—twenty prints of kabuki performances arranged on the wall, and Japanese festival dolls on the fireplace mantle (see also 131)—and recalls Yeats inquiries about Kikuchi Kan (playwright and novelist, 1888-1948) and Japanese literature, and his remarks about the ‘inspiration’ he had found in Japanese ‘beauty’, particularly in his writing of the ‘plays for dancers’ (12, 14a-b, 17a). First appeared in Japanese in Yeats shishû (Tokyo: Hokuseido, 1958), a collection of Oshima’s translations of Yeats’s poems. Reprinted in E. H. Mikhail, ed., W. B. Yeats: Interviews and Recollections, vol. 2 (London: Macmillan, 1977). g. Material about Sato. Oshima’s ‘An Interview with Mr. Junzô Sato [March 1964]’ and Sato’s ‘A Sketch of My Life’ together constitute the fullest account in English of Sato’s memories of the circumstances surrounding Yeats’s acquisition of the Japanese sword that appears in Meditations in Time of Civil War (21), A Dialogue of Self and Soul (30a), SYMBOLS (32b), and the Vision Papers (57, especially d-e, and see 48k for Yeats’s own recollection). The interview includes discussion of Yeats’s interest in Japanese subjects, including the nô, Japanese literature, and the ‘philosophy of Zen Buddhism’, and his wish to travel to Japan in 1920 (see notes at 48i). h. Bibliography of Yeats in Japan. Includes translations and most Yeats criticism published in Japan through 1965.
i. Reviews: F. A. C. Wilson (Modern Language Review 63 : 469-70) notes that while Oshima’s essays are not ‘comprehensive enough to fill [the] gap’ in Yeats studies caused by the ‘dearth of material about his awareness of eastern culture’, they ‘contribute interestingly to our understanding especially of Yeats’s alignment to Taoism and Zen Buddhism’; Frank Tuohy (Studies in English Literature 43 : 284-86) writes that the book is ‘a remarkable and unusual contribution’ to Yeats studies, though suggests that Oshima ‘has sometimes taken the passing interest of a voracious and restless mind to indicate a more profound and sympathetic knowledge than [Yeats] actually possessed’; Rivers Carew (Dublin Magazine 5/1 : 81) finds the book ‘not designed as a work of searching scholarship’, but that it is nonetheless a ‘beautifully produced and illustrated tribute’; other favourable comment is offered by Rachel Burrows (‘Yeats’s Debt to Japan’, Irish Times 17 December 1965, p. 9), Austin Clarke (‘Yeats and the Noh Plays’, Irish Press, 23 October 1965, p. 6), James Kirkup (Japan Quarterly 12 : 540-42), Giorgio Melchiori (Notes and Queries OS 211/NS13/3 : 114-17), and Patrick O’Flanagan (Monumenta Nipponica 21 : 420-21). See also 136.